Inspired by the lace up detail on shoes worn by rockstars all over the world, this screened design showcases a white lace up detail against a pink onesie. This eye-catching design is sure to cause a few heads to turn with it’s bold graphic and unique design. 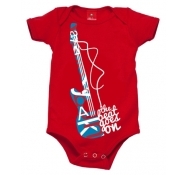 All of our onesies are made of super soft cotton and are Made in the USA. Created using safe, non-toxic and eco-friendly ink printing, each onesie is not only safe for your child to wear, they were made using environmentally safe products as well.